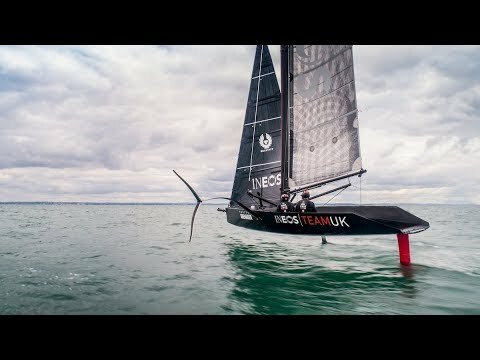 Britain’s America’s Cup challenger INEOS Team UK has been filmed testing its small-scale foiling mono-hull T5 for the first time. While no team’s full-size race boat can be launched before March 31, 2019, the team has been training with the small-scale boat since June. The T5 measures 8.5 metres and is 40% of the size of the full scale AC75 race boat which will be used in the 36th America’s Cup in 2021. The model has been modified to feature the basic features of the AC75. Modifications have included the installation of two foil arms, T-foils and control systems. The rudder, deck layout, hardware and rig have also been altered. 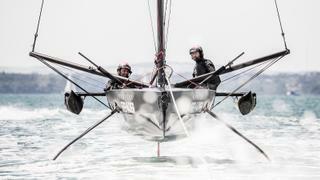 Training with the T5 will enable the team to test the concept and verify the modelling for the design of their first AC75 race boat. 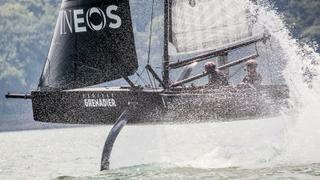 INEOS chief executive Grant Simmer said testing the model was the beginning of a long design and development process for the team, which is led by Sir Ben Ainslie. “We know the other teams won't be that far behind us and we must keep pushing harder than ever. This is a good start and a real credit to the whole team."